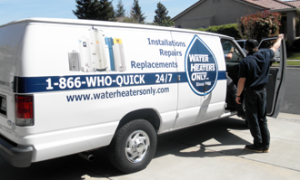 Water Heaters Only, Inc.About Us - Water Heaters Only, Inc.
About Water Heaters Only Inc. 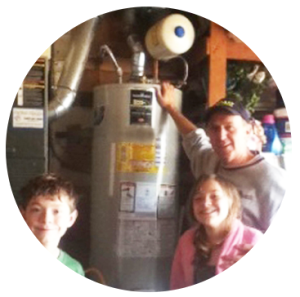 It was in 1968 that our founder realized that there were no companies that specialized only in working on water heaters. At the time, you choices were: Sears, a plumber, or your Uncle Joe that came to mind right after you noticed a puddle under your cold, water heater tank. He thought Sears, who contracted their work out (he had done their work as a subcontractor) had poor service and offered only their brand of water heater, plumbers tended to charge an “arm and a leg” and weren’t known for great their service either, and “Uncle Joe” would always want a favor in return and might even put the pressure relief valve on the cold water inlet. 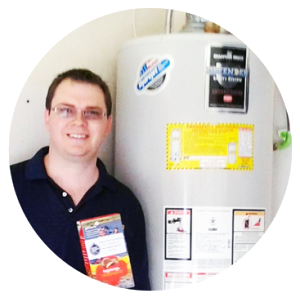 The concept our founder developed included training technicians to a high standard that included concentrating all their energy on only one thing: water heaters. They wouldn’t be tested on cleaning drains or the proper setting of a toilet; however, they would know water heaters inside and out. These technicians would be given trucks that would fit their needs so there would be no tangle of sewer cables and they would have every conceivable part required to install or repair a water heater perfectly. This concept included a dedication to excellent customer service like none that had ever been offered for water heater repair or replacement. Telephones would be answered by real, live experienced people at 24 hours of the day, every day of the year. And there would never be extra charges for weekend or holiday service! That way we could guarantee our customers that they were getting the best service available at the lowest price. 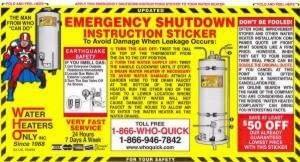 Another novel idea was the creation of our “Emergency Shutdown Instruction Sticker”. These would eventually be direct mailed to millions of homes and were designed to assist homeowners in shutting down and draining their heaters to avoid damage to their homes from water or gas leakage and as a means of connecting to our services. 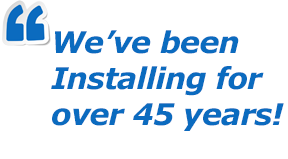 Here we are nearly 50 years later and it’s our commitment to fast service, high quality products and unbeatable prices that has us still going strong as America’s favorite water heater specialist! 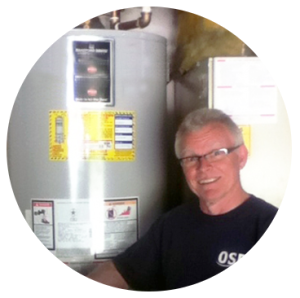 Do you have a Water Heaters Only, Inc sticker on your water heater? Email Riverside@WaterHeatersOnly.com to get one mailed to you! Thank you for contacting Water Heaters Only. We’ll be with you shorty. 425 W. La Cadena, Unit 20. © 2017 Water Heaters Only Inc.